The photo was taken up in the Puertos del Maravio, half an hour from where I live, in a “Paisaje Natural protegido”. I was walking on the border between Grado, Yernes and Tameza and Teverga at around 1100 metros, according to my altimeter, when I saw the wild cat. It was about twenty metres away. Everything happened in a flash. 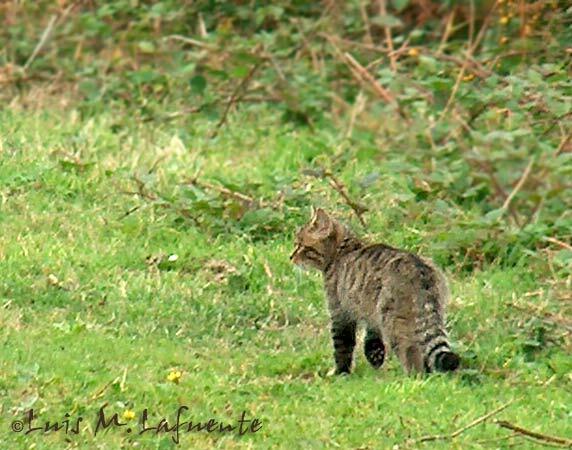 The wild cat is similar to the domestic moggy, but it is larger, more corpulent, and (look at the photo) a telltale bushy tail, with black rings and ending in a black point. Its ears are small and its snout is short. Felis lybica jordansi or African mountain cat, present on Mallorca . A mixture of wishful thinking and its greater size often lead people to mistake the wild cat for an Iberian lynx. 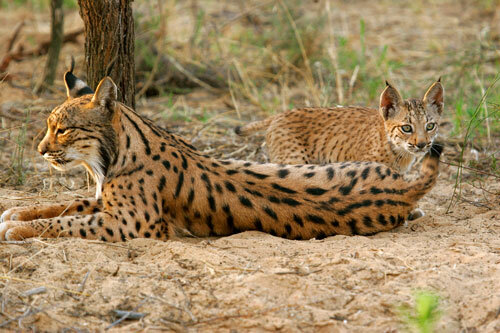 If you’re not in Doñana or the Andujar area, it’s not a lynx.